Trans-umbilical single incision laparoscopic surgery is attracting attention as a next generation laparoscopic surgery as it gives an excellent cosmetic result. However, there is a shortcoming in the method; the surgical cost jumps when using a highly flexible forceps or using a small-head port. 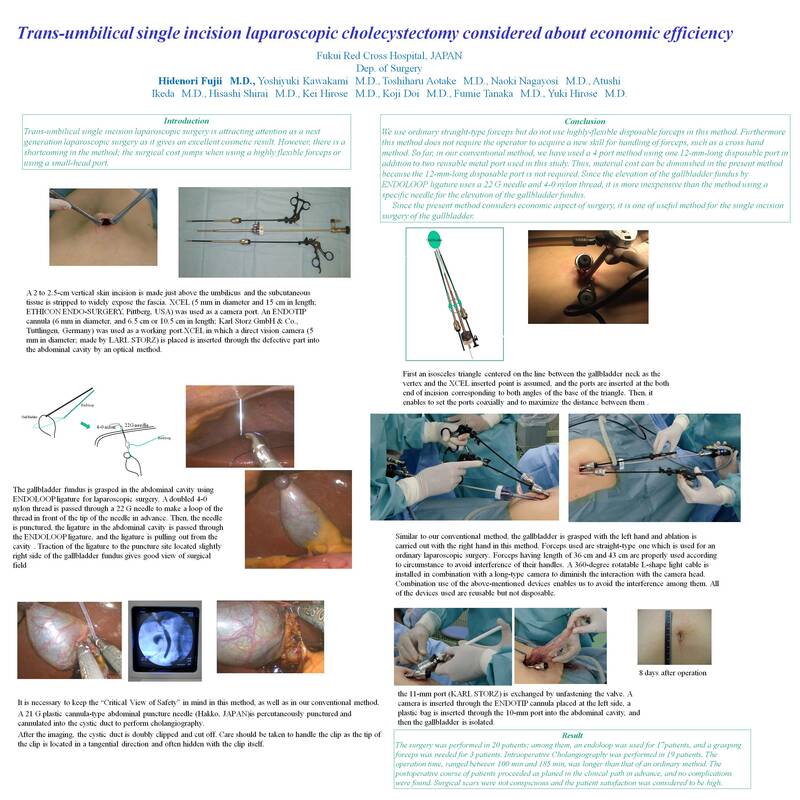 In the present study, we introduced a method of trans-umbilical single incision laparoscopic cholecystomy which was also considered about economic efficiency. XCEL (5 mm in diameter and 15 cm in length; ETHICON ENDO-SURGERY, Pittberg, USA) was used as a camera port. An ENDOTIP cannula (6 mm in diameter, and 6.5 cm or 10.5 cm in length; Karl Storz GmbH & Co., Tuttlingen, Germany) was used as a working port. The port is a reusable metal port used for ordinary surgery. Since its head is relatively small, interference of the head can be minimized by properly using the port of different length according to circumstance. Forceps used was straight-type one which is usually applied for ordinary laparoscopic surgery. Forceps having length of 31 cm, 36 cm or 42 cm was properly used according to circumstance to avoid interference of its handle. These forceps are reusable, not disposable. A patient was placed in supine position with leg split. The fascia was exposed by about 2.5-cm vertical incision of the umbilical region. The abdominal cavity was insufflated through a pneumoperitoneum needle, and XCEL was inserted to the cavity. The inside of the abdominal cavity was observed by 5-mm rigid scope. A difficult case should be approached by an ordinary surgical technique. The fascia was incised at the left and right cranial side of the camera port, and an ENDOTIP cannula was inserted. The gallbladder was grasped by an endoloop (ETHICON ENDO-SURGERY) or by a grasping forceps which was directly inserted to the foot side of the camera port. The surgery was performed in 10 patients; among them, an endoloop was used for8 patients, and a grasping forceps was needed for 2 patients. Intraoperative Cholangiography was performed in 9 patients. The operation time, ranged between96 min and180 min, was longer than that of an ordinary method. The postoperative course of patients proceeded as planed in the clinical path in advance, and no complications were found. Surgical scars were not conspicuous and the patient satisfaction was considered to be high. Surgical cost of our method was the same as or lesser than that of an ordinary method because a number of ports used was fewer in our method. Therefore, our method is considered to be superior in the economic efficiency than an ordinary method.